2017 New Music Favorites: That’s A Wrap! 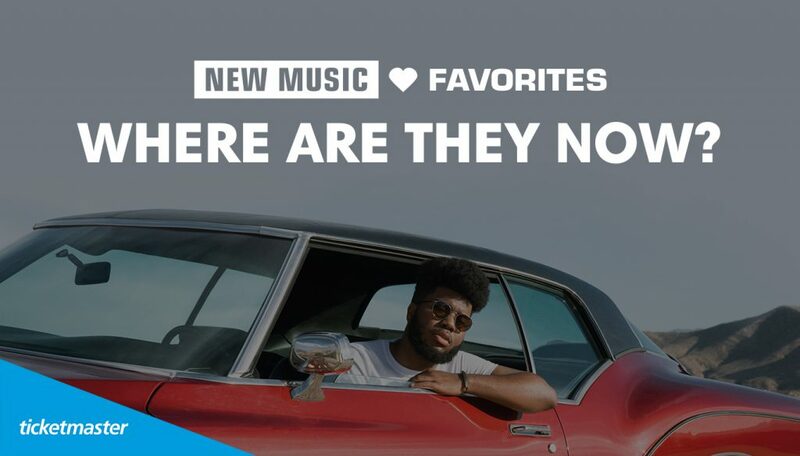 Whether you’re streaming their latest single or watching them play live, Ticketmaster’s New Music Favorites represent the best up and coming artists from around the musical globe. They’re rockers and rappers, country singers and pop stars, top 40 and underground. They’re the artists you need to know going into 2018, and thanks to Ticketmaster, now you do. The 2017 Class of New Music Favorites are already topping the pop charts, showing up in year end “Best Of” lists and selling out venues. “American Teen” Khalid has racked up 5 Grammy nominations, including Best New Artist and Song Of The Year, performed at the American Music Awards with Imagine Dragons, appeared in Charli XCX’s “Boys” music video and is gearing up for “The Roxy Tour,” which kicks off at New York’s Radio City Music Hall in January, 2018. Country singer Brett Young received nominations for the Country Music Association Awards’ New Artist of the Year and the Academy of Country Music’s New Male Vocalist of the Year. His self-titled debut album contained the number one hit single “In Case You Didn’t Know,” and he toured with Luke Bryan and Lady Antebellum. Brett is currently working on his sophomore effort and looking forward to hitting the road next year as a headliner. Viral pop-rappers Jack & Jack released a new EP, Gone, and have been selling out shows around the country. They also won the 2017 iHeartRadio Music Social Star Award, which was voted on by the fans. On the heels of releasing their debut album, About U, moody electronic pop band MUNA appeared on Jimmy Kimmel Live, appeared at the Firefly and Austin City Limits music festivals, toured with Harry Styles and remixed Katy Perry. Alt-pop three-piece LANY released their debut album and keep getting bigger and bigger. Their relentless touring has helped them move to large venues, with sold out shows at home and in Europe. A R I Z O N A played the festival circuit, including Lollapalooza and shows with Fall Out Boy, collabed with Don Diablo and Robin Schulz and played a series of sold out shows, on their own and with Kevin Garrett. Electro-power-pop leading lady Betty Who released her second album, The Valley, and recently announced a third leg of her ‘Party In The Valley’ tour due to overwhelming demand. Keep an eye out in 2018 to see what music history these artists make and see who Ticketmaster features next as a New Music Favorite!